Really nice place and the people are so friendly. There are many different rooms to choose from and plenty of activities for everyone. Oasis At Mesa Palms was very nice, including the people. It's just that the rooms were too small. They have card games, other events, and a little library. The people were very pleasant and nice, it was just too slow-paced for me. You couldn't ask for nicer people, and the time they spent with me was great. Everything was very clean, pleasant, and nice. I think the food was very good. Oasis At Mesa Palms was very good, nice, and clean. Everybody was very friendly. I had a very delicious chicken Caesar salad. They had a swimming pool, hot tub, exercise room, library, and activities room. We chose Oasis at Mesa Palms. They have independent living, and they provide food and transportation. I hear the food is good, they have laundry facilities inside the apartment, and the apartment I saw had a nice floor plan. The grounds were nice, well-kept, the location is comfortable for us, and everybody seemed to be friendly. The manager seemed to know everybody by name. The staff of Oasis at Mesa Palms was nice. They had a lounge area, music room, and a room for the TV where you could bring your guests. The dining area looked fine. Oasis at Mesa Palmas was a community with apartments. If you needed any medical assistance, you could bring your own because they did not have more care available. It was an apartment complex. The rooms were very nice and had a kitchen. I liked the open concept. The staff and the residents were very nice. Oasis at Mesa Palms is excellent and has huge rooms with plenty of room. The food was excellent. The staff was most accommodating. The place is very clean, very well run, and the people were well informed. They took me on a tour, and they called a woman and asked her if she could show her apartment so I could see it with furniture and everything in it. She is very nice and accommodating. I like the kitchen, the bathroom, the living room, dining room and the patio. Oasis at Mesa Palms was all very nice. I am trying to save enough money so I can get in. We saw one person reading a newspaper and eating breakfast, and they were very friendly to talk to. The staff was getting the dining room ready for the luncheon, and they were very friendly. They showed us the swimming pool with a jacuzzi and salon. The staff here at Oasis At Mesa Palms has been really friendly and helpful. It's pretty, and I like it here. They would go to the store for you if you need groceries. We have a pool, a library, an exercise room, and elevators. The food is very good -- excellent, in fact. We have a dining room with tablecloths and napkins, and it is an elegant area. They take us to town or to the casinos. I really like my apartment. It is nice, and I can get anywhere with my walker. I like the setup of the place. Oasis At Mesa Palms serves very good restaurant-style food. I have a 2-bedroom unit with a kitchen, and it is OK. There is a bigger 2-bedroom unit with a walk-in closet. There are things I can do here like outings, shopping, and concerts. The staff is very nice. What I like about this place is that it is a privately-owned company. We loved Mesa Palms; their apartments were wonderful, and their pricing was amazing. It was 45 minutes away, and it was a family-run property. I liked the fact that the owners were in the property. I was impressed with the owner; it was very clear that he knew his people, and the average person lived there for 6 to 10 years. It was reasonably priced, and they had 1-bedroom apartments. Oasis At Mesa Palms was a nice place. I enjoyed the visit and the people that were there. I enjoyed the company. The dining area had a kitchen area, and people come out and serve you. They had a swimming pool, and they had exercise. You have the option to go down to the cafeteria and have them prepare your food there, or you could prepare food in your apartment. Oasis was real great; it’s almost exactly what we wanted although the cost was a little high, so we have to rearrange everything. Everybody was helpful, and everything seemed very clean. My experience at Oasis at Mesa Palms was not as good. The rooms were pretty nice. Once I saw the ambiance and the atmosphere, I got kind of turned off. The staff was quite good, friendly, forward, and informative. I liked that. The price at Oasis at Mesa Palms was just right, and they had a lot of amenities. Everyone was really friendly, so it seemed like a good place. They had a calendar posted with a lot of activities. We were really happy with the different options that they had available. I liked Oasis at Mesa Palms, but it was not in an area that we wanted to be in. It’s a very nice place, but not appealing to her because it was far from her friends and family. The place smelled nice. The food smelled good, and the residents spoke highly of the place. My mother moved from this retirement community a few months ago mainly due to the NOISE created by the neighbor's daughter. The property owner's son informed the neighbor of the disturbance issue three times, but the situation did not change. Also, the fact that the same neighbor brought BED BUGS onto the property caused reason for concern. In addition, the FOOD QUALITY is poor! Oasis at Mesa Palms is nice and very well-taken care of. The staff is fine; they are great. My dad actually has a two-bedroom that has got a full kitchen, and it is very big. The food is very good. The dining room is fine, very spacious, and has enough room where they can put tables together if they have bigger parties or special events going on. There are like flexible tables and stuff, and it is a nice and big dining room, very well-taken care of, and clean. They have all kinds of stuff. They have a pool and spa, and then they have a van that takes them on trips. He has already gone to Sedona and a couple other places. I am actually impressed by just the spaciousness of the rooms and stuff. And for the amount of money it is, it is well worth it. My parents moved in at Oasis at Mesa Palms. That's the one place my mom wasn't upset with. My mom is still transitioning, but my dad is doing fine. She has a little dementia, so it takes time. Their style wasn't so fancy, unlike the others we've visited. It's a gated community, and they were really nice. They have a 2-bedroom/ 2-bath apartment. It's less than 1000 square feet with a dining area, a living room, and a kitchen. Mom gets to bring her cat, so she's fine with that. The residents I talked to seemed very happy there. Oasis at Mesa Palms was a very friendly place. The facility was well-planned. Their apartments were larger than most. Every apartment has a balcony, which is nice. Also you can bring in your own furniture in there. The staff was very friendly. They answered all questions I had for them. They did have activities. They described a couple of them. Regarding the staff, I had a chance to talk to some of them and they were all very positive about the place. My personal expierences with this assisted living facility have always been very good. The apartments and grounds are very well kept, and the owners are quick to address any problems. The dining room serves very tasty and healthy food options. The staff in the dining room are wonderful. The servers and busers are very quick to laugh, and get you whatever you need or want. The chefs and nutritionist are eager to get feedback so they check in with most of the table during the meals. Every person I have come into contact with (that is employed by Mesa Palms) always has a smile on their face, and a kind word to say. I know they have a bus that will take the residents t scheduled places like the doctor, and the grocery store, and my grandmother has always said very good things about that service. Mesa Palms has a few activties each week such as cards, crafts, and auctions for the residents. My grandmother loves going to these activities, and always makes a point to attend. From what I understand this facility offers solo living, and the option of a nurse coming by when needed. I don't believe this facility has a full care option (I'm not sure since my grandparents have never needed it). The only drawback I have ever seen with this facility is the location. The neighborhood surrounding the facility is a little dangerous. This facility is in an old part of town, and there is a lot of riff-raff out at night. The lcation is the only reason I did not give this facility five starts. Overall my grandmother could not be happier with her living situation. What makes Mesa Palms unique? Quite simply, it is home. Home, in the truest sense of the word, with all the comfort, warmth, and security a home provides. It is also about outstanding service. Imagine all your needs taken care of by Mesa Palms caring staff, leaving you time to rekindle an acquaintance, explore a favorite interest, enjoy a secure relaxing afternoon around the pool or pamper yourself with a massage. Amidst their treasured belongings, community members live in individual apartments overlooking well kept and attractive grounds. Residents can workout at the Oasis Fitness Center or enjoy the comfortable atmosphere of the community center with friends and family alike. The three words that come to mind when describing The Oasis at Mesa Plams are FUN, FRIENDLY and FAMILY…we have that old neighborhood feeling, tasty homestyle food such as our chicken and dumplings and coconut cream pie! Ask our residents about the "best in the east" staff who care about them and always walk the extra mile for them. They are truly like family. Located near the Mesa Country Club, Mesa Palms is only minutes from shopping, health care and recreation. We offer a variety of apartment sizes with tastefully designed floor plans to choose from. Each can be decorated in your own personal style. The choice is yours! 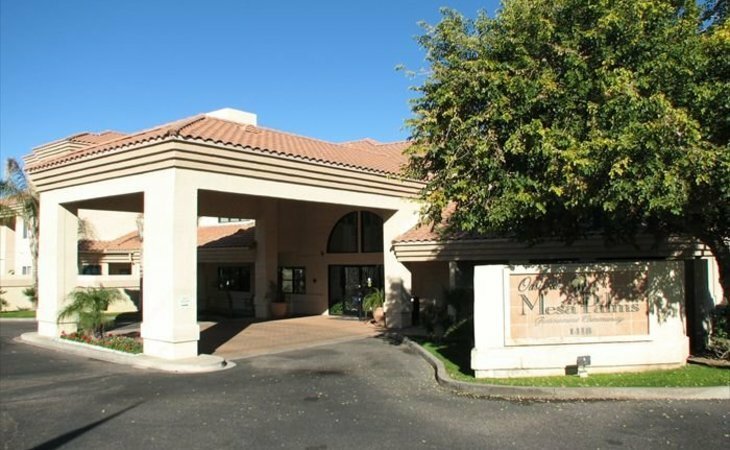 What should caregivers and potential residents know about Oasis At Mesa Palms?